Kealoha brings the skills of both physicist and artist to The Story of Everything. Artists can take an infinite number of paths to finding their creative sweet spot. Not many of those paths wind their way through a career as a nuclear physicist. 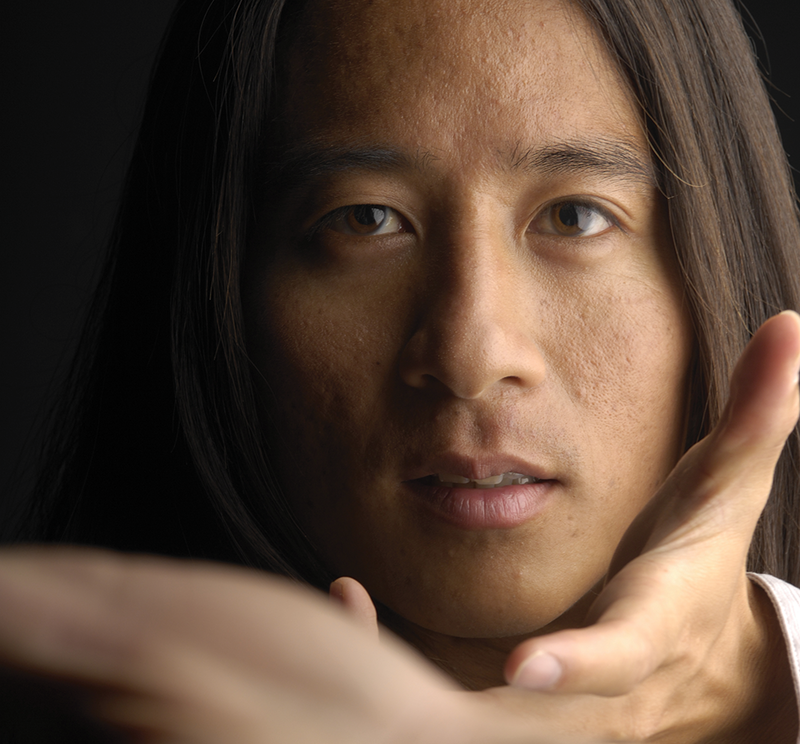 However, for Kealoha—the poet laureate of Hawaii, who brings his evening-length performance piece The Story of Everything to Utah this week—it has felt natural for most of his life to combine his interests in math and science with his interest in language. He recalls an occasion during a high-school assembly in Honolulu when a Hawaiian poet named Lois-Anne Yamanaka read from her first book of poems. "Before that, I'd only been exposed to writers from other worlds," Kealoha recalls. "But I remember watching her, and I thought she was speaking for me. Her voice was my voice." Still, he found himself drawn in his academic studies to nuclear physics, and attended MIT, where he graduated with a degree in engineering. He found particular fascination in the burgeoning science of nuclear fusion, but soon found himself frustrated with his work. "You have this viewpoint that you're going to go out and change the world with the science you're doing," he says, "but then you see the reality that you're going to be in a basement with fluorescent lights, tooling around on Excel spreadsheets. Plus the field I was in, fusion energy, the problems were less about the technology than the politics. You become a little bit jaded, because you see this amazing technology that could change the world, and politicians are bought off by big oil interests." Kealoha transitioned from research into consulting in the private sector after a move to the San Francisco Bay area, and it was there that he connected with the local slam poetry scene after seeing an ad in a local alt-weekly. And while the stereotype of the lab nerd might suggest a difficult transition to performing poetry on a stage, the art form immediately spoke to him. "For me, it was the perfect combination of the words with theater, movement, the musical element," he says. "I grew up dancing and acting. I wasn't really an introvert. This was real, it was human, it was people in a room together sharing ideas, building a community. That's something I was needing." The Story of Everything certainly incorporates Kealoha's talents as a poet, but it also expands the scale to a theatrical performance piece that includes multi-media art, music and dance. It was inspired, as many singular creative works are, by a major life transition for the artist. "I found out that I was going to have a child in 2011," he recalls. "So I did what most people do: I freaked out. What's this fatherhood thing all about? So I took some time to gather my thoughts, ... and I thought, 'One day, this child is going to ask where we come from.' It's not like I have one thing I subscribe to as a creation story. But I do subscribe to science, so I set out to write from a scientific viewpoint." The result is a narrative about the origins of the universe that transforms cosmic-scale events into metaphorical stories, like the creation of the solar system becoming a love triangle between the Earth, the sun and the moon. He also reaches toward the future in talking about the need to address global climate change—a subject about which he once drafted a white paper that was presented to the Pentagon. For Kealoha, combining his art with his scientific background is a natural fit, where he believes the skill set required for the latter actually helps make him a better poet. "With science, especially with physics and nuclear physics, the things you're talking about—protons, neutrons, quarks—there's no visual for them" he says. "You have to have a pretty decent imagination to picture all of these interactions. So having that sense of imagination feeds directly into the ability to tell a good story, and describe abstract things. The other thing I've found is that when I'm writing poetry, I'm usually trying to analyze an emotion, or a problem that I see within myself or the community. So I'm using the basic forms of analysis to break down these ideas into smaller parts, solving those smaller parts, then bringing them back to a conclusion." He also realizes that one of the factors limiting the ability of the scientific community to have more people accept the reality of climate change is a reliance on data, rather than on understanding how to reach people through a story. "We need to touch people on an emotional level if you want to bring about a change in perspective," Kealoha says. "You have to strip down all the science you know and think, 'What matters to people?'" What matters to Kealoha is using his unique mix of skills and knowledge to do exactly that—as he describes it, "being a bridge" to help laypeople understand science. "This is what my life has led up to," he says about The Story of Everything. "It has everything I've ever learned in my entire life."